It’s no trick to grow perennial asters, but it’s sure a treat for bees and butterflies as we head into October. Still, you can’t beat my neighbor’s aloe for the longest blooming plant around. It hasn’t taken a break since early last spring, a coral beacon for insects and migratory hummingbirds heading in or heading back out. That’s a great thing about native rock rose (Pavonia lasiopetala), too. After a sensational spring cycle, it starts all over again in fall. If we deadhead in late spring and rain favors us a bit, we’ll even get summer blooms. 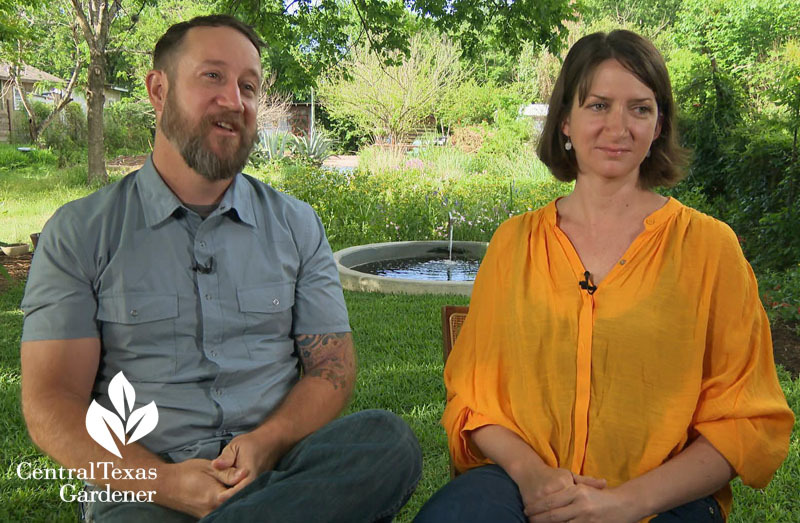 To get your garden on the hummingbird radar, this week Andrea DeLong-Amaya from the Lady Bird Johnson Wildflower Center spotlights a few garden groceries. Watch now! Providing on-going food is essential, not just for hummingbirds, but for everyone on the wing. 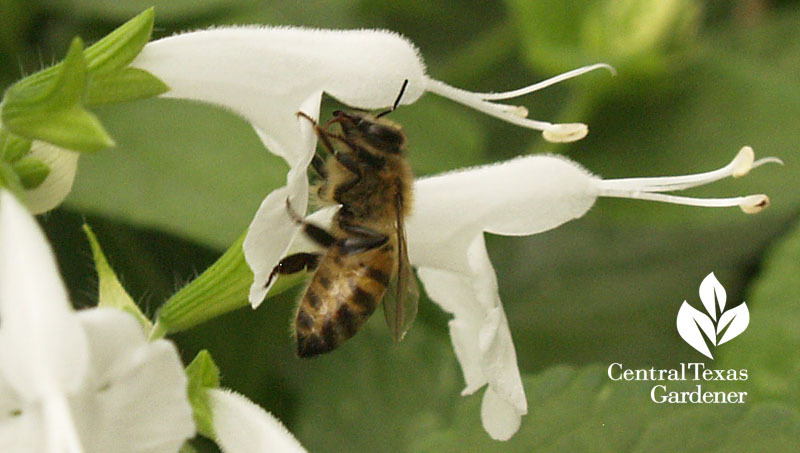 Salvias are tops on the list with those flowery tubes. Salvia farinacea blooms spring and fall. Salvia farinacea ‘Henry Duelberg’ is a recent hybrid. These herbaceous plants die to the ground in winter but return as rosettes in the spring. 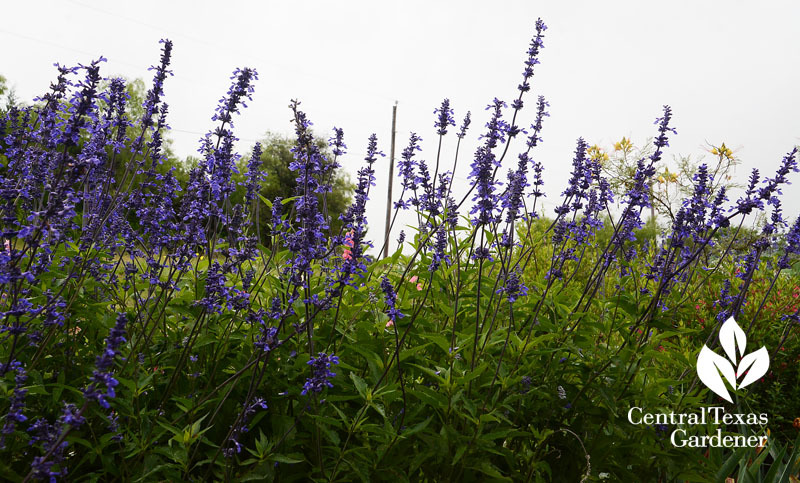 Salvia greggii is an evergreen that benefits from hard shearing in January/February and light pruning in May and late August. 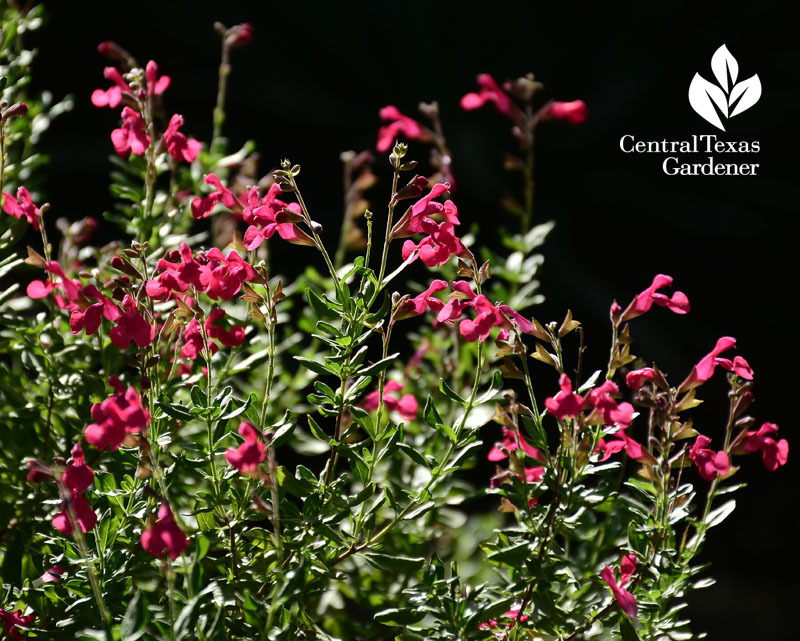 When Salvia farinacea and greggi rest in summer, annual warm weather S. coccinea fills the void until the first hard frost. 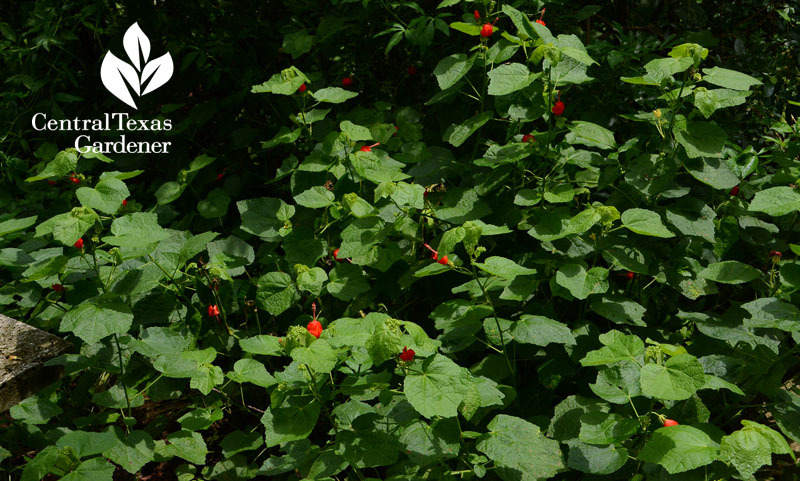 Super drought tough Turk’s cap adapts to part sun and dappled shade, blooming spring through frost. Although small-sized, deep red Heartleaf hibiscus (Hibiscus martianus) flags down hummingbirds on the hunt. 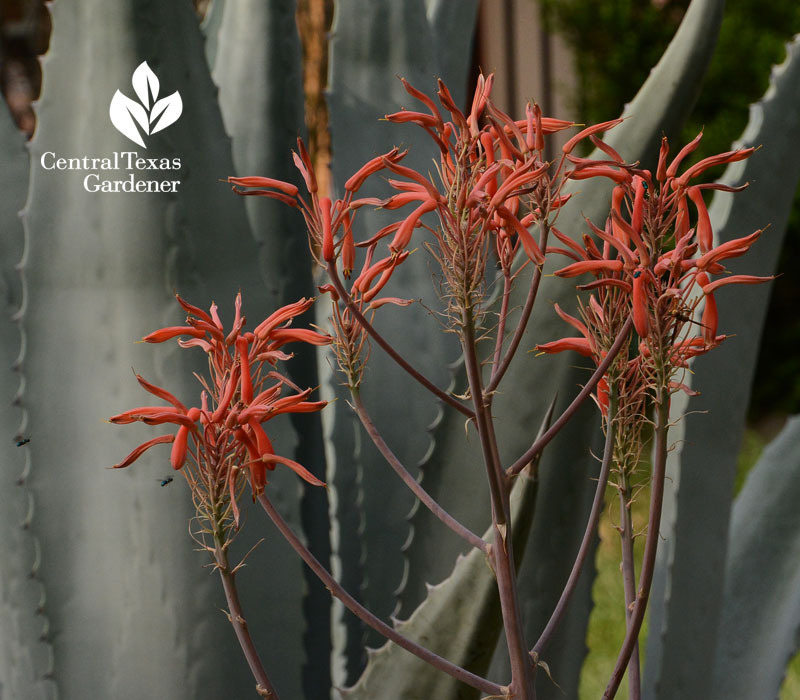 Summer through fall, shrubby perennial flame acanthus doesn’t need much water to pump out flaming flowers. 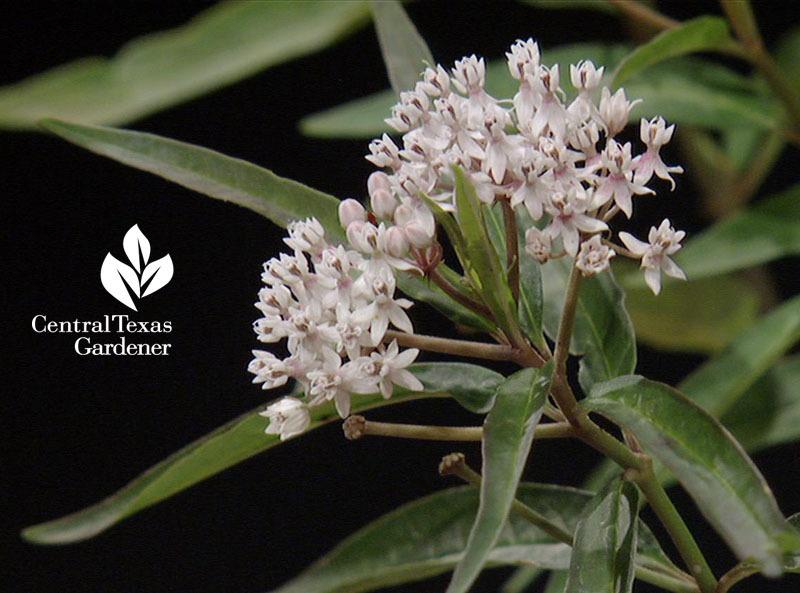 In ditches, wet lands or other hydrated soil, Aquatic milkweed (Asclepias perennis) provides nectar to hummingbirds, bees, and butterflies. Evergreen penstemon rosettes shoot up panicles of tiny tubular blooms in spring. Gulf penstemon (P. tenuis) is one of many. 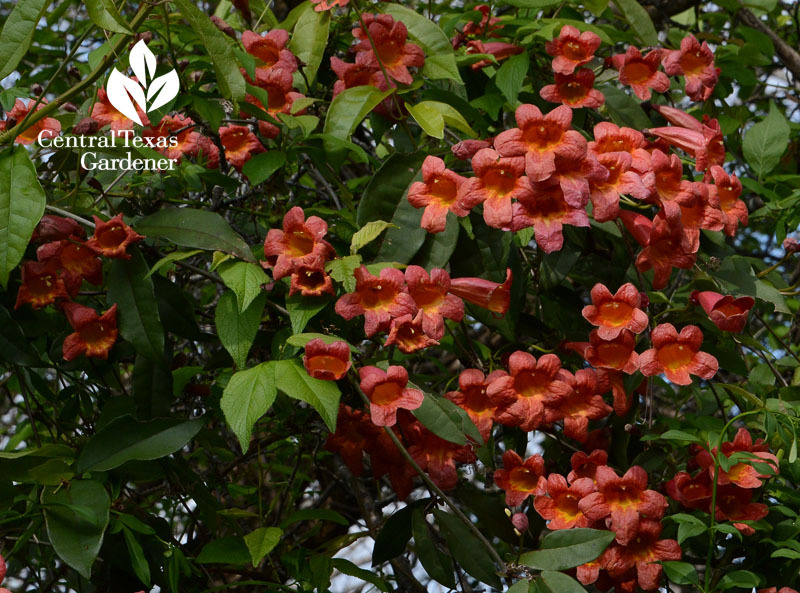 To cover a fence or trellis, spring and sometimes fall-blooming native crossvine (Bignonia capreolata), including hybrid ‘Tangerine Dream’, shouts for attention. 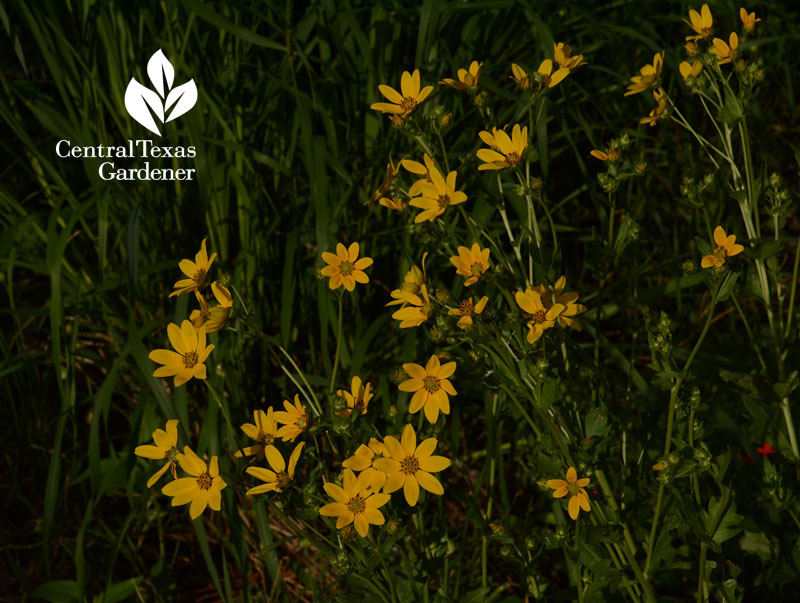 Native four-nerve daisy doesn’t attract hummingbirds, but its nectar-rich flowers feed pollinators in spring through fall. 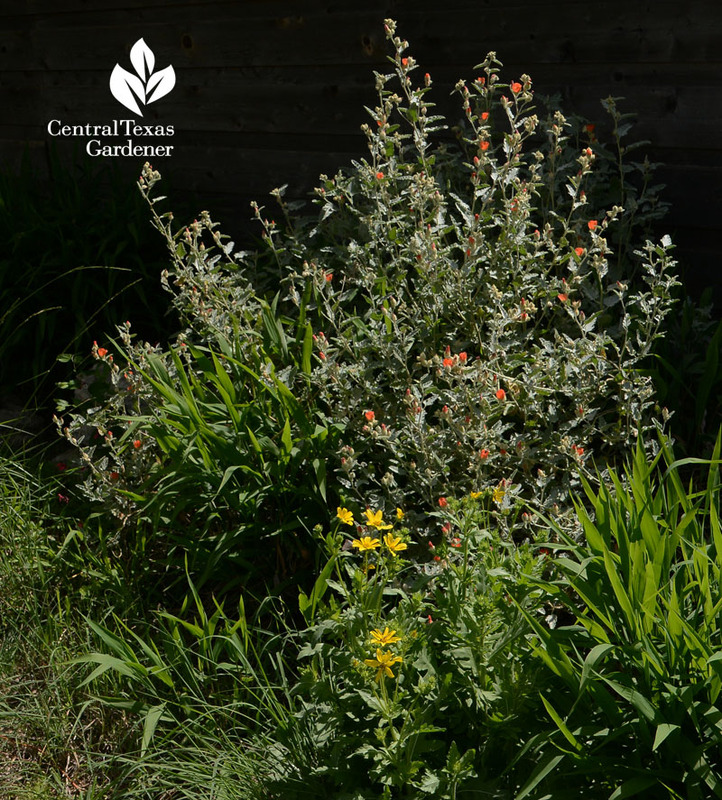 It tucks in nicely to border large perennials or succulents in part shade to sunny well-drained soils. Find out more as Daphne’s Plant of the Week. 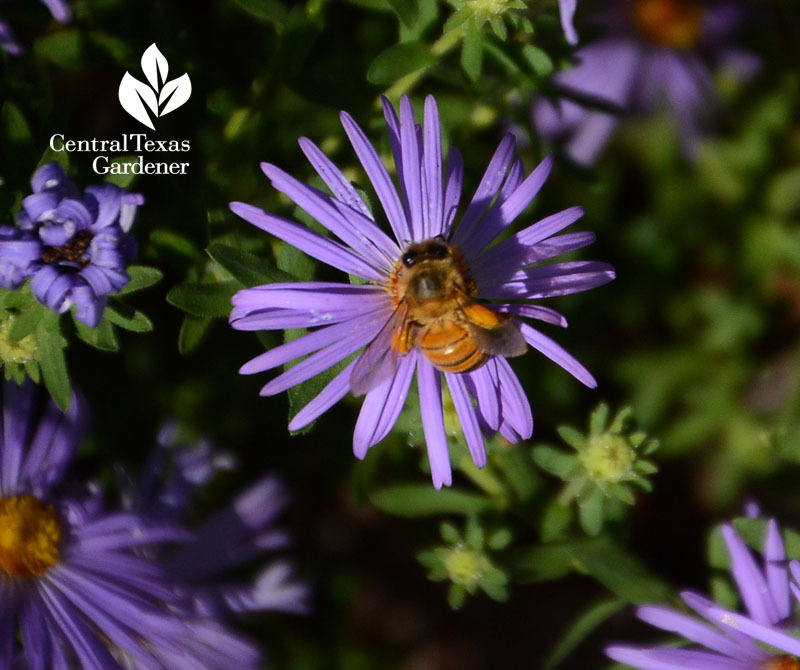 Stock up on native plants of all kinds at the Wildflower Center’s Fall Plant Sale Oct. 20 (members only) and Oct. 21. 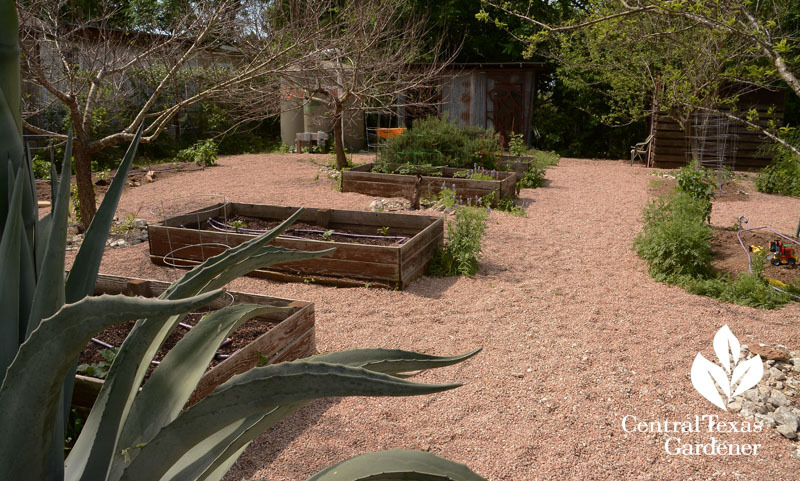 Not only does soil temperature matter to our wildflower seeds, it makes a difference on what happens in the vegetable garden. 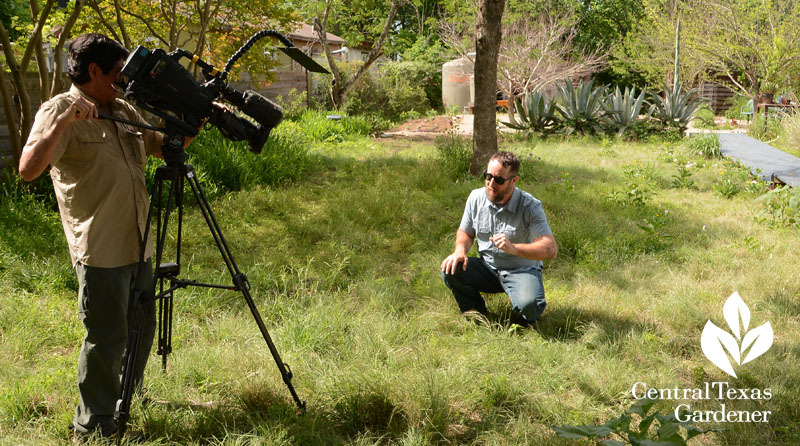 Since our temperatures are so up and down, Jeff Ferris from The Natural Gardener explains why it’s important to take your soil’s temperature. 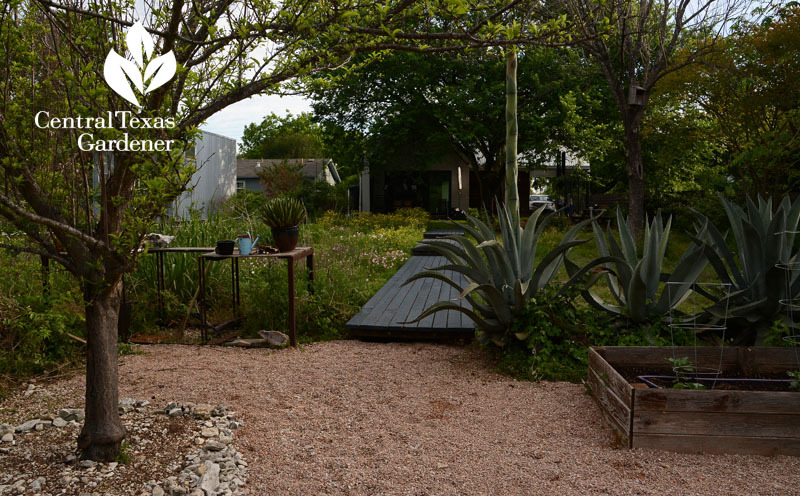 On tour, a backyard once home to invasive plants and energetic weeds now hosts countless wildlife eager to feed and reproduce on native perennials, wildflowers, and grasses. 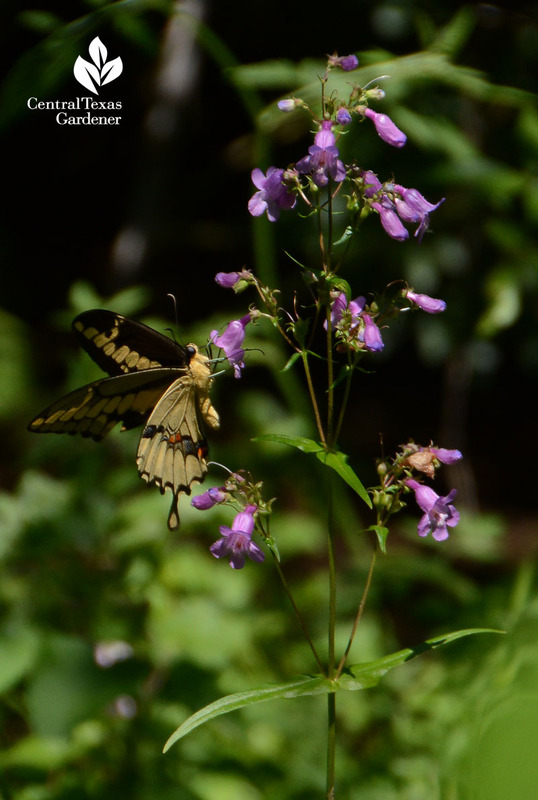 Even though it meant backbreaking digging, year-long solarizing, and lots of soil restoration, a native plant pocket prairie was paramount to John Hart Asher and Bonnie Evridge. 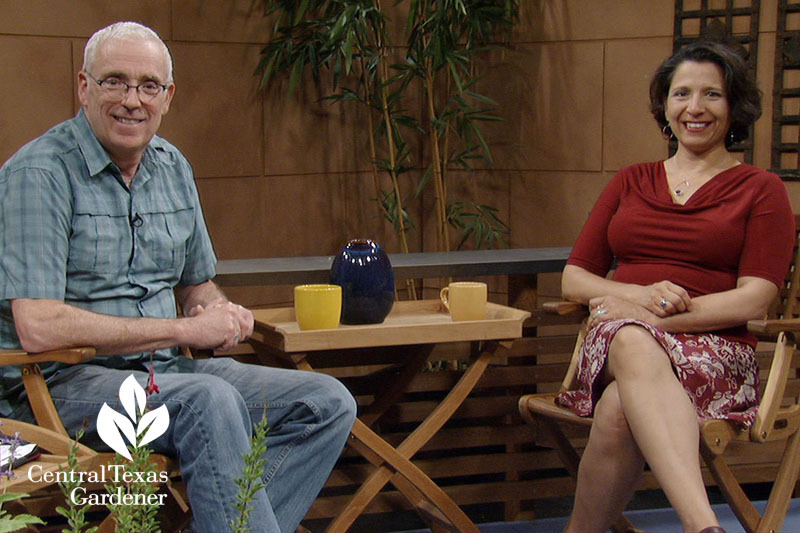 After all, John Hart restores prairies as an environmental designer for the Lady Bird Johnson Wildflower Center and Bonnie works for the Texas Commission on Environmental Quality in their air permits division program. 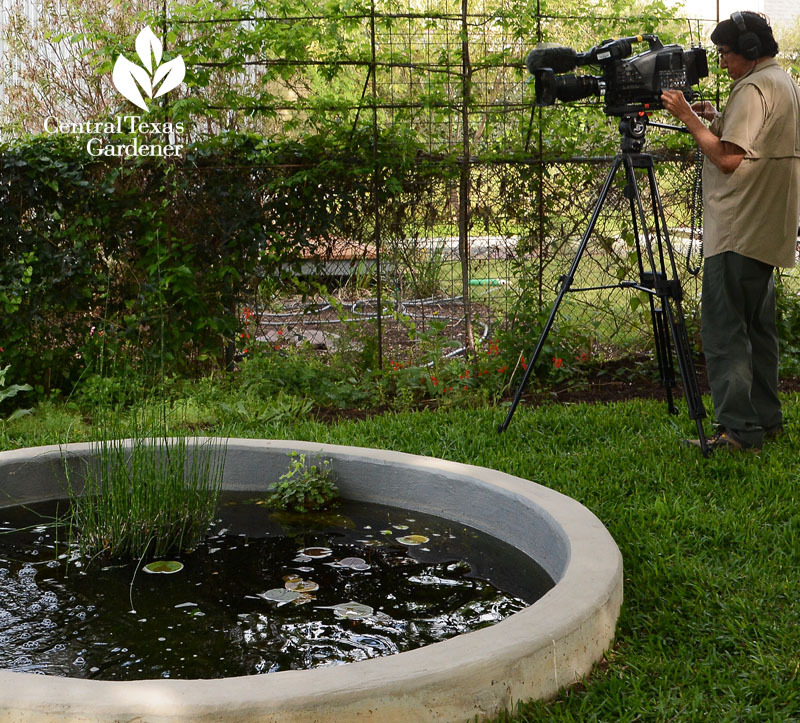 On the flower side, native Texas star stole the show on our April visit. Summer and fall perennials and annuals were already sneaking in. This hummingbird clearwing moth stopped by the pink evening primrose. 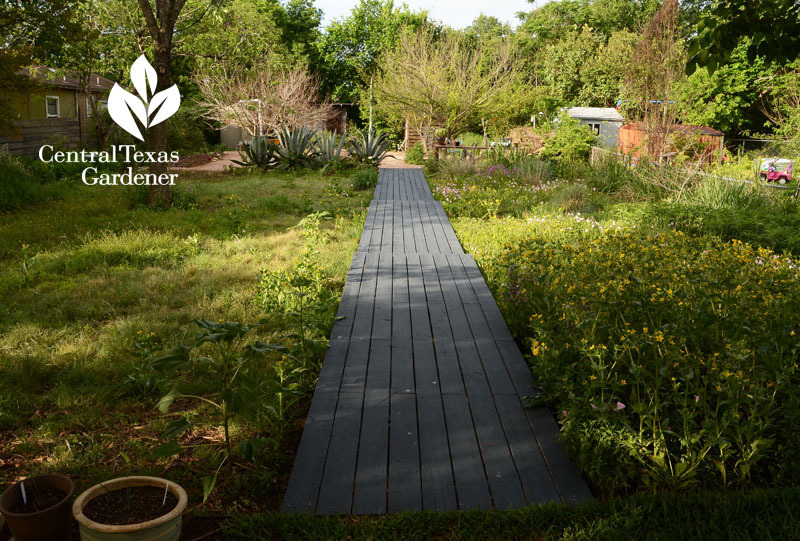 The grasses side mixes Habiturf, a blend of Buffalo grass, curly mesquite and blue grama, with green sprangletop, sideoats gramma, and purple threeawn. 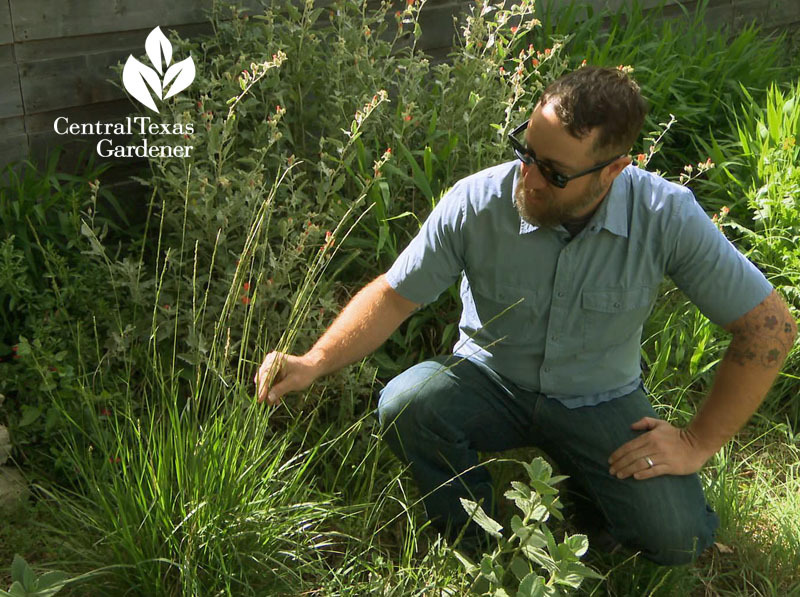 John Hart shows off a native cupgrass that attracted the garden’s first Painted Bunting. 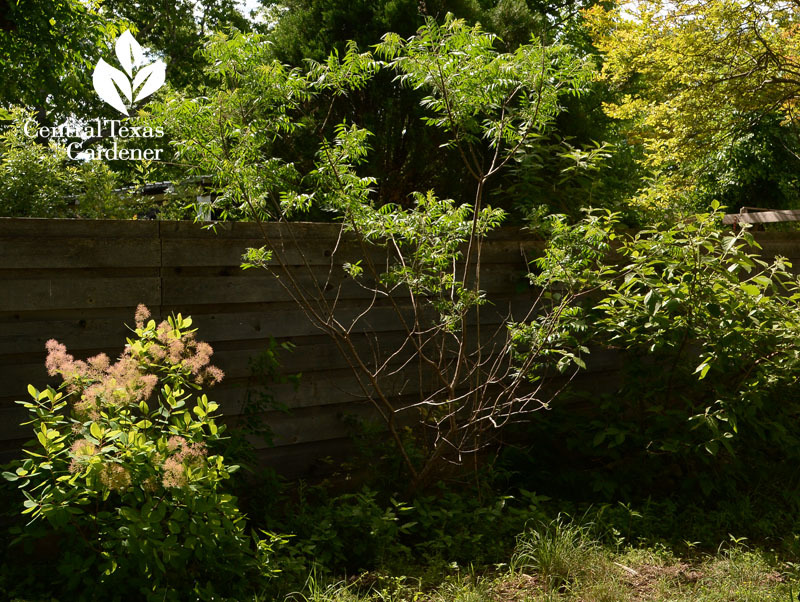 Perennials and small trees camouflage the fence, like this native smoke tree and flameleaf sumac. Diversity protects against species decline and provides ongoing larval host options. 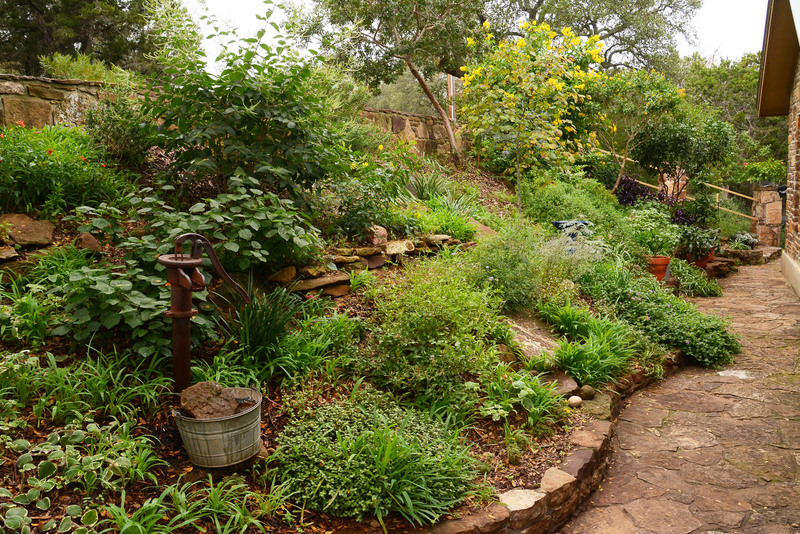 Progressive flowering and grasses ensure food and habitat all year. Native desert globemallow crosses the seasons from spring through fall. 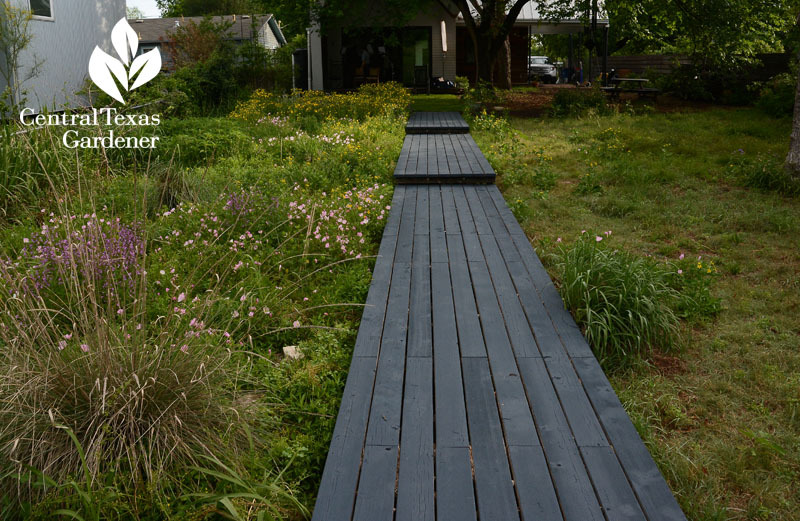 John Hart bisected the prairie with a slightly elevated boardwalk of 2 by 4 cedar supported by welded 3-inch square steel tubes. 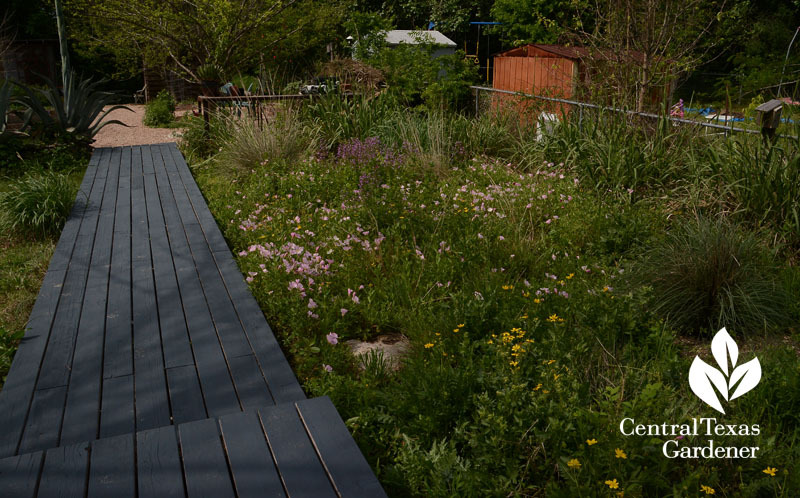 At first they stained it, but painting it a deep blue-gray furthers their visual guideline through the prairie to the vegetable garden and chicken coop. 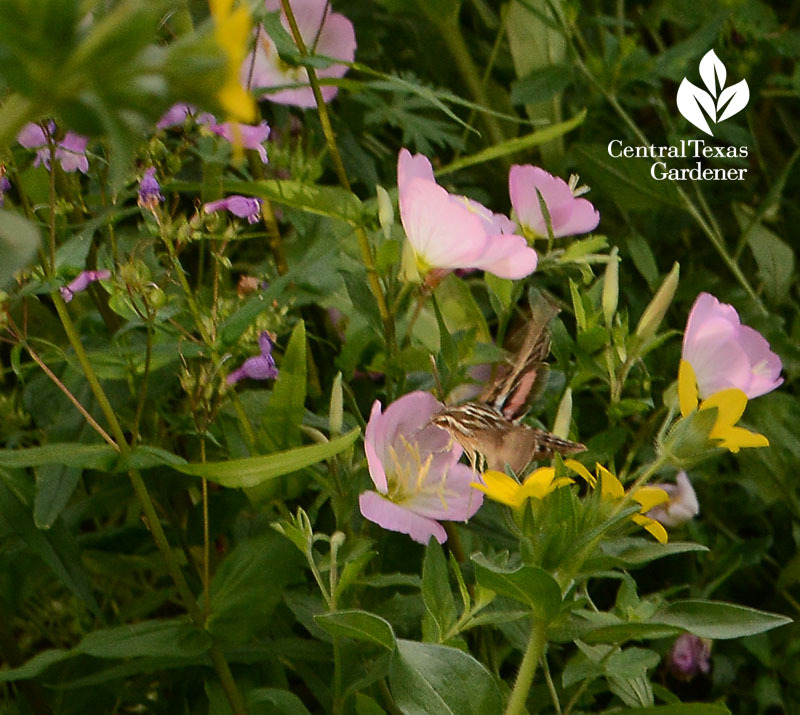 The path of least resistance also reduces soil compaction, especially in the flower prairie. 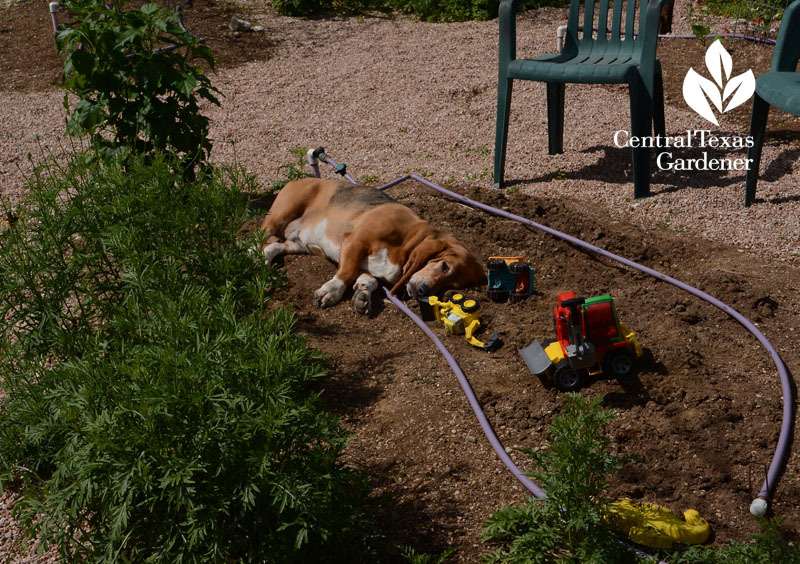 The grasses can handle family romps with young son Adler and dogs. 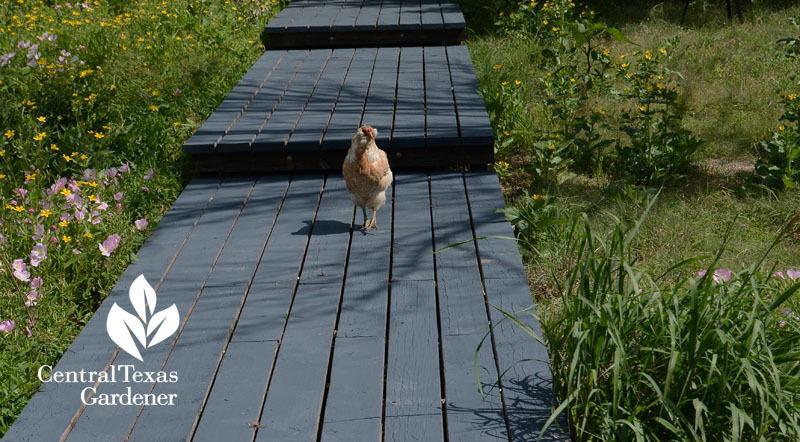 Chickens stroll for pest insects or to just egg on director Ed. Near the house, the trees and Adler dictated another design: a shady, soft playground. 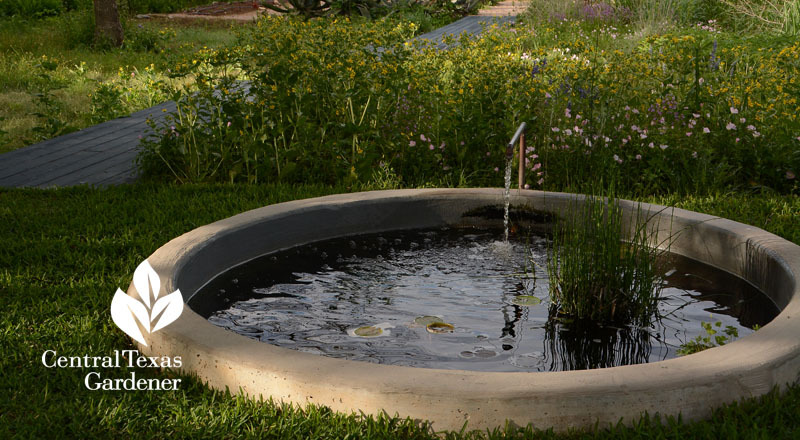 To bring in wetlands diversity and wildlife drinking fountain, they designed a round cement pond to complement the straight-line geometry. Adler is quite keen on its native fish! One of their objectives was bringing daily outdoor discoveries right up close. For privacy and visual interest on the open fence, John Hart espaliered a Mexican plum. 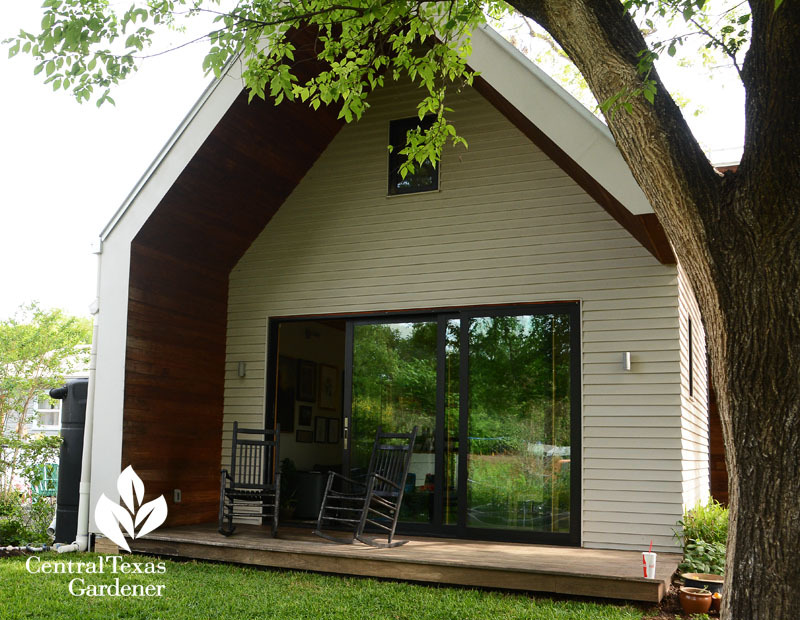 Working with Thoughtbarn Architects, their top-rated LEED home respects and connects to the land that greets them morning and night. 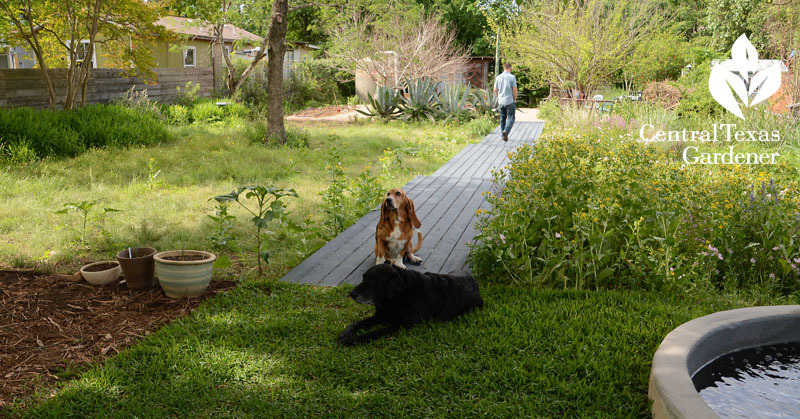 I love how they broke up this long rectangular yard! The length-wise prairie contributes depth. 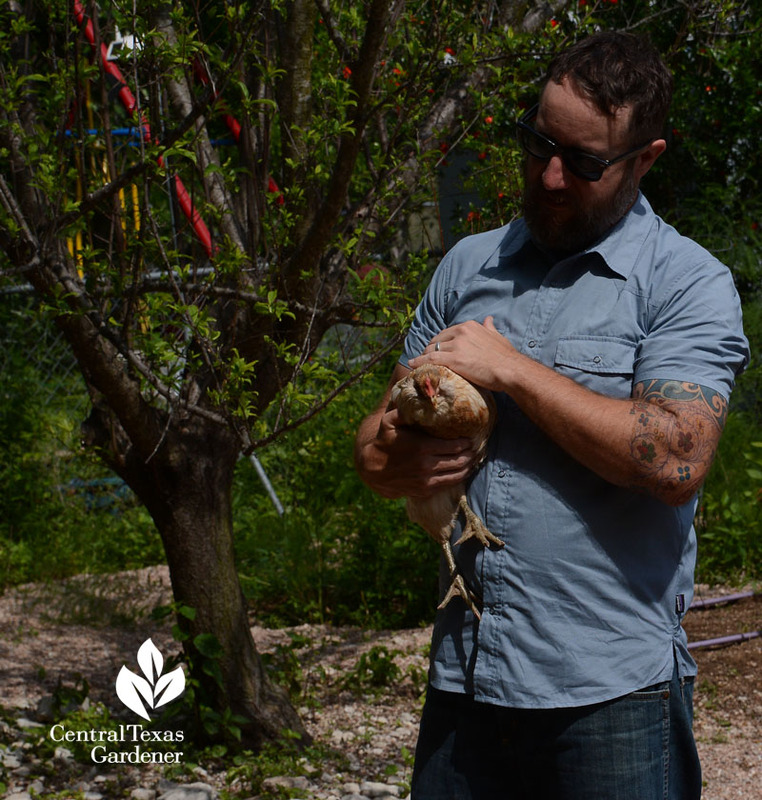 The cross-wise garden in back gives them room to grow fruit trees and organic vegetables and raise happy hens for fresh eggs. 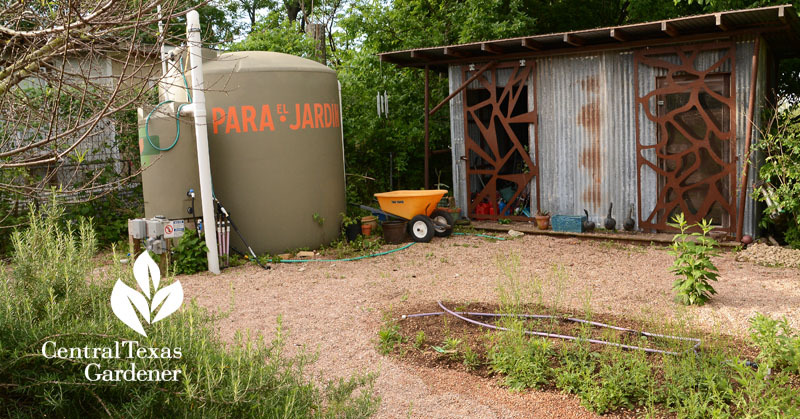 A rainwater collection tank takes care of the vegetable beds (hence the lavender-colored drip hoses signifying non-potable water). A tank near the house waters the grass and nearby beds. Special thanks to filmmakers Sam Wainwright Douglas and David Hartstein who provided some of their footage. 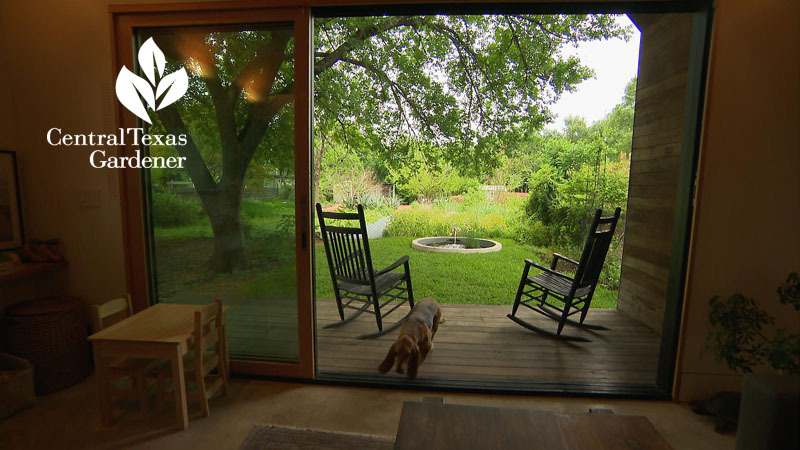 Check out their latest works and of course, Citizen Architect, that aired on PBS!